Despite the trials and tribulations of this crazy world, we sometimes hear the heartwarming moments when somebody tells of how the guy in line ahead at the drive-thru picks up the tab on your sack of hamburgers or an anonymous someone has flowers delivered to your front office just to brighten your day out of the blue. Well, as the United Way of Southwest Michigan Kicks off the 2017 Campaign next week, they are encouraging all of us to consider similar small Acts of Kindness next week and then sharing the story on social media platforms to encourage encore performances across the market. Our friends at United Way of Southwest Michigan invite the entire community to get involved in their 75 Acts of Kindness to mark not only the launch of the new campaign, but also the 75th Anniversary of the United Way organization in Michigan’s Great Southwest. In honor of the 75th anniversary, United Way is asking us all to engage in an Act of Kindness and share that experience via social media using hashtag #75ActsUnited. The acts of kindness can range from taking out the trash for your neighbor, buying a coffee for the person behind you in the drive-thru line, or delivering a box of bagels to a municipal police, fire or public works department, or other public office. The options are nearly endless and the non-profit organization that serves Berrien and Cass counties is encouraging creativity. United Way hopes to see 75 different posts to social media with that hashtag of #75ActsUnited. 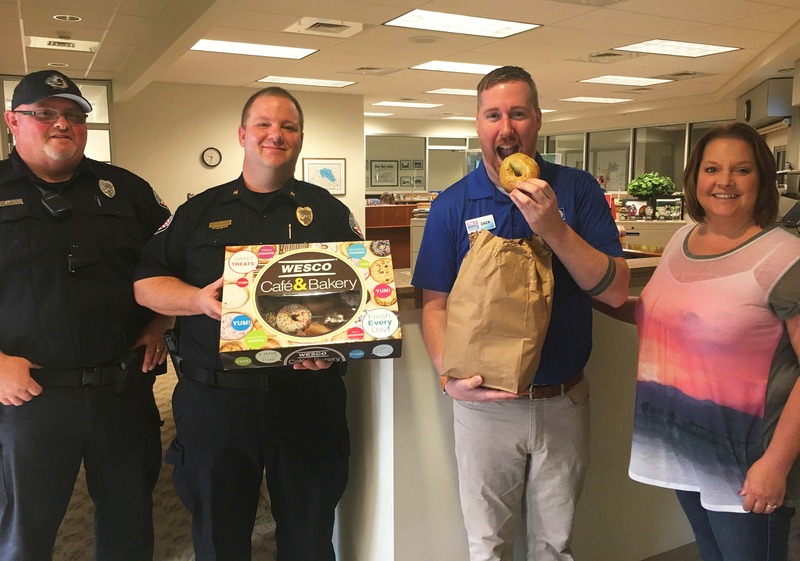 Last week, Zack East, from Mid-West Family Broadcasting and United Way Campaign Co-Chair, delivered donuts to the Coloma Police Department as a thank you for the work that law enforcement does in their community. Nicki Britten of the Berrien County Health Department went office to office and cleaned co-workers’ keyboards as way to show her act of kindness. Andy Janson from Hanson Logistics surprised two children from the Boys and Girls Club of Benton Harbor with backpacks, filled with school supplies and gift cards, so they would be equipped for their first day of school. United Way of Southwest Michigan fights for the Health, Education, and Financial Stability of every person in every community. They do this by LIVING UNITED. By forging unlikely partnerships. By finding new solutions to old problems. And by mobilizing the best resources. To join the fight, visit www.uwsm.org.